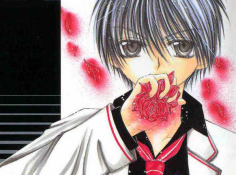 Rio is a transfer student in Kao Gakuin, who is longing to find her "man of destiny". She met Kanna the first day at school, and he told her that he'd be her man of destiny. He's the student chair, even though he's still in junior high, and the heir to the Ohba financial group. Rio is appointed to be the vice chair (who is also called "the queen") by this "king" of the school, and then she's locked in the VIP room. What is going to happen to our "queen"? !